A documentary movie, an active social media presence, adoring fans and worldwide recognition –is there anything left for Griffith’s Park mountain lion known as P-22 to conquer? How about a museum exhibit that features the life and times of L.A.’s urban nature icon? Opening this weekend at the Natural History Museum of Los Angeles County is a new installation The Story of P-22, L.A.’s Most Famous Feline that offers an immersive experience about not just one mountain lion’s journey and life in Griffith Park (which is well-documented in fun and engaging hands-on exhibits) but also the survival challenges he and all SoCal wild lions face living in L.A.’s backyard. CLASSIC PHOTO — Photographer Steve Winter‘s amazing photo of P-22 welcomes guests to the new pop-up installation on the urban cat’s life at the Natural History Museum. Once inside the installation, check out camera trap photos taken by now NHM biologist and Citizen Science Coordinator Miguel Ordenana in 2012 who first discovered the cat living in the urban park. Other large video screens show how the cat was captured and collared by National Park Service rangers as they officially added him to their puma study, making him the 22 such cat to be tracked – hence, P (puma) -22. Other installation content explores what P-22 eats (with a shout out to the notorious koala meal he had at the L.A. Zoo in 2016), how he maps and marks his territory. A touchable topographical 3-D map of Griffith Park gives a snapshot of the small territory this cat has roamed, roughly 6 square miles. A mountain lion’s typical territory ranges from 10 to 350 square miles. 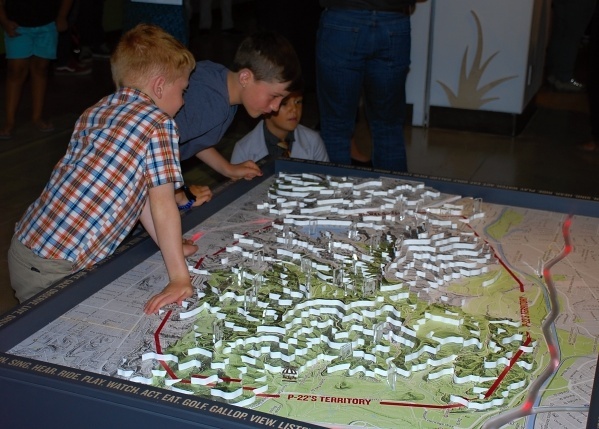 IMAGINING THE PATHWAYS – A topographical map of Griffith Park invites guests to imagine where the big cat could be RIGHT NOW! 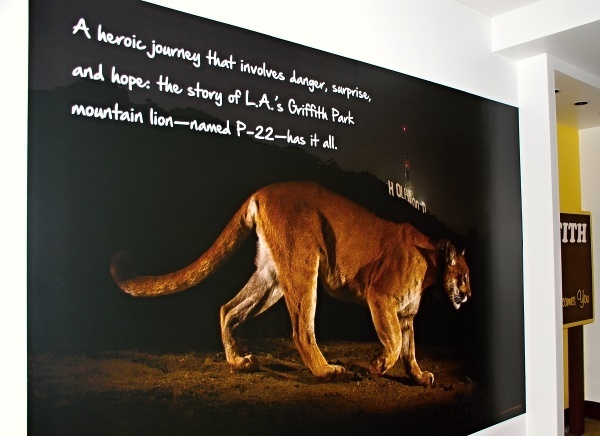 When visiting, pay attention to a soundscape wall that plays the sounds of Griffith Park and imagine what P-22 hears on a daily basis, from the sound of the merry-go-round, traffic, human hikers to the crickets of the night. The installation is free with museum admission. More details here.